An angiographic catheter is a small plastic tube designed to be inserted into the femoral artery or another blood vessel during coronary angiography. The catheter functions as a conduit for contrast dye during the procedure, making the arteries visible on x-ray. In most cases, coronary angiography is a very safe. However, a minority of patients will experience side effects and complications, some of which may be serious. Coronary angiography (also called cardiac angiogram or arteriogram) is a diagnostic test that allows a cardiologist to evaluate the build-up of plaque in the coronary arteries, the veins that supply oxygen –rich blood to the heart. This buildup can cause coronary heart disease as the plaque hardens, narrows the arteries and reduces blood flow to the heart. Patients who suffer from coronary heart disease are at risk for angina, heart attack, and blood clots. During coronary angiography, a catheter is placed into a blood vessel in the patient’s arm, groin (upper thigh), or neck. The tube is threaded into the coronary arteries, and a contrast dye is released into the bloodstream. X-rays are taken to trace the flow of the dye through the blood vessels of the heart. Bleeding and infection at catheter insertion site. Patients most at risk for these types of complications include those with chronic kidney disease and diabetes. Beacon Tip Torcon NB Advantage Catheters. Beacon Tip Royal Flush Plus High-Flow Catheters. Cook Medical has received 26 reports of device malfunction associated with these catheters, with 14 resulting in adverse events. 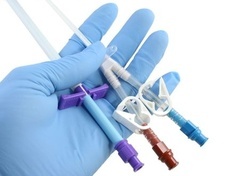 The U.S. Food & Drug Administration (FDA) has deemed this action a Class I recall, which indicates that the affected catheters pose a risk of serious injury or death. The Beacon Tip Catheters involved in Cook’s recall were manufactured from May 9, 2013, to September 1, 2014, and distributed from June 6, 2013, to June 25, 2015. Cook Medical has asked its customers to immediately quarantine unused products from their inventory and return the catheters to the company as soon as possible.